Cydia is always the first choice among the iOS users as it enables them to jailbreak their devices. It is the perfect source to enhance the boundaries of your iOS device. You may surely be well aware of the concept of jailbreak and if not still; let me explain it to you. Most of the applications are designed and developed for working on specific operating systems. Every smartphone has its own limitations which do not allow the third party sources to get installed on it so that to protect them from various issues. If someone is looking for a break down the boundaries of their device and need to extend its capabilities; they surely need to jailbreak their devices. It needs to have the use of some software to go along with the one and Cydia is the one among them. Karen and Saurik actually create Cydia. Immortal Cydia is actually the best alternative for AppSync which is perfectly designed and developed to work on iOS 10 and above. Just download various apps, tweaks, and themes by using this free app and enhance the capabilities of your iOS device with the usage of Immortal Cydia now. 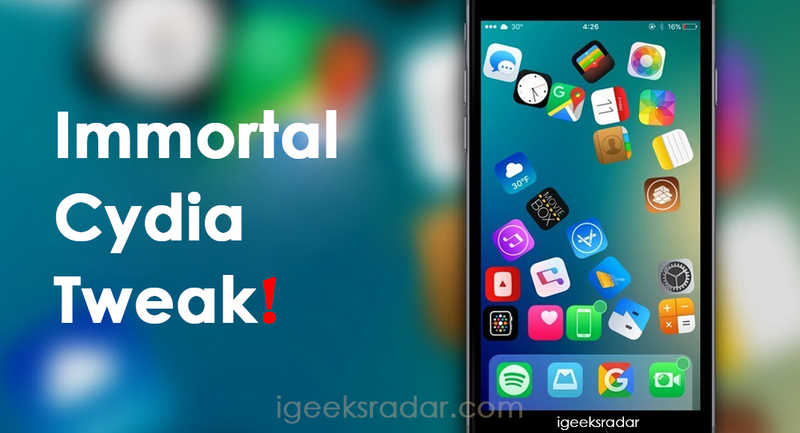 Immortal is one of the best and most popular Cydia tweaks for iOS 10 and above users which enables them to prevent the expiration of the signed iOS applications. It is perfect bypass limit for the signed applications which prevent them from being get expired. It also enables the users to install unlimited applications through their Cydia impactor and that too without spending anything. All you need to have for is a working free apple developer account; that’s all. But before going further with the installation process, you first need to clear some concept regarding it so that you can understand it in a better way. Every time you reboot the iOS device you need to install Immortal Cydia on your device as it may get automatically uninstalled during the process. So if you are a habit of rebooting of your device time and again then don’t install it on your device as it may lead to the deletion of all the sideload apps which actually work on jailbreak will stop working automatically. Another thing you need to keep in mind is that you need to sideload your apps time and again along with Cydia Impactor every time you reboot your device. Cydia Impactor is not an entirely fledged replacement for the AppSync. It is just a temporary alternative which may get deleted once your iOS gets switched off. Cydia Eraser: Download Cydia Eraser to Remove Jailbreak on iPhone/iPad Updated Steps. It is a perfect alternative to the AppSync which enables you to jailbreak iOS 10 and higher versions of iOS devices. It offers you a bypass for installing various tweaks and themes at the matter of just a few clicks. The interface it uses is very user-friendly which most of us can easily work upon. The compatibility of this wonderful tool is also appreciable and works efficiently on iOS 10 and above. It prevents the expiration of various signed iOS applications. Launch your Safari web browser and then search for the option of Debian package in the search bar or Download it from here. Once find it; just press the Download option in order to get the Debian package on your device. Once done with it; wait for the download process to get completed. The Debian package comes up within the zip file folder; just unzip it in order to explore it. You will get a list of various options there from where select the Library option and then head towards the option of Mobile Substrate. Once done with it; now select the option of DynamicLibraries and then transfer the dylib and plist files to bootstrap/ Library /SBInject folder. On the successful completion of the above process; allow your device for respiring. That’s all done with it. 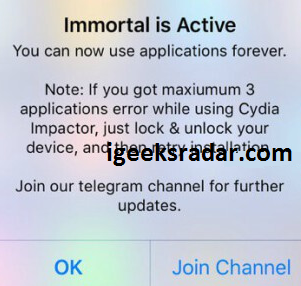 Your Immortal Cydia has been successfully installed on your iOS device, and you will get notified with the help of a pop-up notification message showing “Immortal is Active” on your Home Screen. Once done with it; enjoying accessing various tweaks and themes easily on your device. LiberiOS: Download LiberiOS Perfect Jailbreak Tool on iOS 12/11+ iPhone/iPad Devices. Immortal Cydia is a fantastic tool for the jail breaker’s which enables them to get a bypass for installing various tweaks and themes on their iOS devices. It keeps all of your iOS applications alive and hence prevents them from getting expired at any cost. So, don’t waste your time in thinking so much. Just install this free application tool on your iOS device now and install various unlimited tweaks and themes on to your device with the help of just a free apple user ID.